Even if you don’t recognize the name, odds are you’ve at least heard the Wilhelm Scream (listen to it here). It’s that classic scream that movie goers around the world remember and is sometimes also called the “Star Wars Scream”. You hear it when Luke Skywalker shoots that Stormtrooper on the Death Star, when Indiana Jones takes down that Nazi, and even when Buzz Lightyear is knocked out of a window. While you may be one of the many people who have thought, “Jeez, can’t they use a different scream? That scream is in every movie!” the truth is that sound editors throughout Hollywood have been sneaking the Wilhelm Scream into their movies as something of a private joke since the 1970s. While there is no way to be 100% sure who owned the magical vocal chords of the person who made that momentous scream, the lead suspect has long been actor and singer/songwriter Sheb Wooley- the man most famous for the song “Purple People Eater”. Wooley had an uncredited part in the first film the scream was heard in, a 1951 film called Distant Drums, starring Gary Cooper as Captain Quincy Wyatt. At one point during the film, Captain Quincy is leading his soldiers through a swamp when one of them gets attacked and dragged under by an alligator, screaming in the process. During post-production recordings, Wooley recorded various vocal sound effects for the film, including a batch of screams- he being known for his screaming ability, something he was quite proud of according to his wife, Linda Dotson. She said in an interview, “He always used to joke about how he was so great about screaming and dying in films.” In that same interview in 2005 (2 years after Wooley’s death), Dotson also confirmed the long suspected fact that Wooley was the man behind the “Wilhelm” scream. 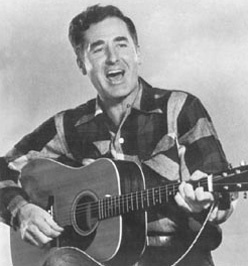 Why was it dubbed the “Wilhelm Scream” if the man who did the scream was named Sheb Wooley? After being plucked from the Warner Brothers stock sound library, the scream was used in the 1953 film The Charge at Feather River, starring Guy Madison as Private Wilhelm. The sound effect is used when Private Wilhelm is shot in the thigh with an arrow. The scream was nicknamed “Wilhelm” from then on. This Hollywood tradition / inside joke of purposefully using the scream in a variety of films began with sound effects designer Ben Burtt (Star Wars, Indiana Jones) who noticed a particular scream being used in a number of Warner Brother’s films: Them in 1954, Helen of Troy in 1956, The Green Berets in 1968, etc. From then on, Burtt began slipping the Wilhelm Scream into every movie he worked on, beginning with George Lucas’s Star Wars: A New Hope. After that, it didn’t take long for the Wilhelm Scream to become Burtt’s personal sound signature, and other sound editors took notice. Following Burtt’s lead, editors like Richard Anderson (Poltergeist) and Mark Mangini (Gremlins) began using the Wilhelm Scream in their own work, feeding the fire and helping the little joke spread. But the trend didn’t stop with sound editors. Some Directors personally sought out the Wilhelm Scream and requested that editors put it in their films as homage to the great movies of the past. Directors like Quentin Tarantino and Peter Jackson loved the idea of including a little Hollywood history in their pictures and went out of their way to see it done. Tarantino put the Wilhelm Scream in his films Reservoir Dogs, Kill Bill Volume 1 and Inglorious Bastards. The scream can also be heard in all of Jackson’s Lord of the Rings movies. So what is happening with the Wilhelm Scream today? It is now 2013 and the Wilhelm Scream is resting comfortably at Skywalker Sound just waiting to be picked up and popped into another film. But it is the end of the road for Ben Burtt, who after joining the Pixar team announced that he would be retiring his personal use of the Wilhelm Scream, though others are sure to continue using it. Wooley wrote the song “Purple People Eater” in under an hour after getting the idea from a joke told by a friend of his. Country Music Hall of Famer Roger Miller (“King of the Road”) was first taught to play the guitar by Wooley. Miller was a cousin of Wooley’s wife. For those of you who can’t get enough of the Wilhelm Scream, you can download the free Wilhelm Scream app that will make your phone do the scream if you give it a toss. In the Disney California Adventure Theme Park, the Wilhelm scream can be heard in the film Golden Dreams. In Over the Hedge, a dragon fly gets zapped and screams a modified Wilhelm Scream, with the scream processed to sound high pitched. So funny. I’ve always called it “the Star Wars scream”. I thought it was just sound technicians being lazy. I didn’t realise it was kind of a joke. Its really freekin annoying. Every time I hear it, it takes me right out of the movie bcus I know what it is. Is this some kind of illuminati thing? Stop doing it. Guy Madison did NOT play Pvt. Wilhelm. He played Miles Archer and Wilhelm was played by Ralph Brooks. Wilhelm gets an arrow in the thigh while sitting on his horse and is a minor character in the movie.